As the caption on the cover of The Couples BrainMap says, this is "a guide to how your brains create your world together." Before pointing to areas of potential conflict and areas of potential synergy, The Couples BrainMap first focuses on how the brains of the partners select, filter and shape information generally. Information, of course, is at the heart of any partnership. 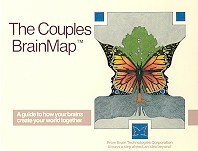 The Couples BrainMap provides two copies of the BrainMap questionnaire. This permits each partner to be the individual they are. The challenge then becomes listening to and comparing, inquiring and explaining, admiring and accepting, two different approaches to "doing a world" together. Can the partners develop core areas of agreement on how they see things? Can they find ways to handle their disagreement on information each thinks is important and information each chooses to ignore? Can each reconcile the other's processing strengths, weaknesses and preferences if they happen to be in conflict with their own? Full color designer-quality cover incorporating two faces interspersed with two traditional symbols of growth, the tree and the butterfly.